This book began with an email between writing partners – one a blonde girl, the other an African American boy, and progressed with all that was, and all that is hoped will be. 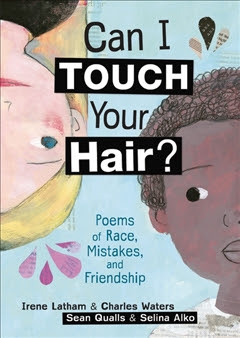 Set in a current day fifth grade classroom made up of a majority of white students and a minority of others, the themes of the poems include hair, shoes, church, the beach, sport, the playground, apology, forgiveness and other interesting and absorbing subjects. Based on the authors’ real life experiences growing up, the poems are filled with metaphors and analogies, beautifully spun with humour, realistic happenings (and some imagined), truths, and conversations that will encourage other conversations about race. Deeply moving reflections of pain and love, good and bad feelings, racist innuendo, and why black and white can’t seem to find harmony except on a piano, vie with other emotions that clutch at the reader’s heart. This book of free verse contains compelling prose that has sweet and sour flavours, but always ends up with a perfect mix of the two. I loved the way the issues were presented in alternating normal then bold font, as if to call attention to both light and dark skin and thought. The illustrations delicately highlight the friction in the text that lies between words and meanings. Can I Touch Your Hair brings awareness to the reality that although we are bathed in, and at times swamped with progress, there are some things that take time to change, and meanwhile, all of us stand and wait to see the outcome.